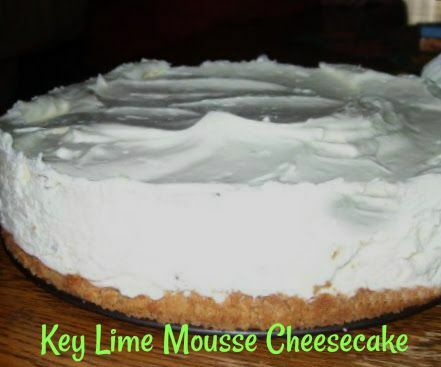 FoodThoughtsOfaChefWannabe: Key Lime Mousse Pie/Cheesecake!!!!! It is FINALLY Friday friends! Man this has been the week from H-E, double hockey sticks!! I apologize for my slacking, just haven't had time this week. It is over, it is done and we never have to relive it again. Right? Can you give me an AMEN to that? When you want to indulge, in something sweet, with a slight tart undertone, a decadent texture and flavor, yet light, this is it! This is the kind of pie you keep going back for, for another piece! Give me cream cheese, fresh whipped cream and butter and it is like my dream recipe for heaven's sake. I can't say no to any of those ingredients!! Can you?!?! This is an amazing recipe I got from a fellow Army mom, way back when my son was in BCT. I needed an easy cheesecake, pie, something, dessert and this is what was shared with me. I made it and could not believe how good it was. I will warn you, it SEEMS like alot of work, but it isn't. There are alot of steps but it is really very easy. The result is a flavor to behold and although I love lime, I did cut the juice in half and and the zest. I will keep the original measurements in and just note what I did. Remember when whipping heavy cream to put your bowl and whisk or beaters in the freezer for 15 min or so before, and that your cream is cold, it will whip up in half the time. You could also use gingersnaps for your crust. When it came time to add my cream cheese, I did it in my food processor! This pie is somewhere between cheesecake and key lime pie. It is so tasty and you could add a couple of drops of green food coloring to drive home the lime and the Christmas color if you wanted! This makes a ton of filling and I think could easily make 2 pies. 1. Combine cookie crumbs and sugar in a large bowl. Pour in melted butter, and mix thoroughly. Press into the bottom, and 1-inch up the sides of a 10-in springform pan. 2. Sprinkle the gelatin over the lime juice in a small bowl, and set aside to soften. Bring 1/2 cup of whipping cream to a simmer in a heavy pan. Remove from heat, and stir in the white chocolate until melted. Mix the gelatin into the chocolate until well combined; set aside to cool. Beat remaining 2 cups of cream to stiff peaks in a large bowl, and set aside. 3. Beat the cream cheese with the sugar with an electric mixer until well blended. Slowly blend chocolate mixture into cream cheese, then mix in lime zest. Fold the whipped cream into the cream cheese mixture, and pour into prepared crust. Cover, and refrigerate overnight. Please take the time to make this incredible dessert. Though I did not garnish mine, the possibilities, especially with the holidays are endless!! I love Key Lime Pie..A must try..Thanks Christine. Love this and no its not hard to make at all. Try it if you like a delicate key lime flavor. I didn't use all the whip it called for though. And next time I'd use a little more lime juice and zest rather than cutting the amounts in half. But it really was worth the effort!